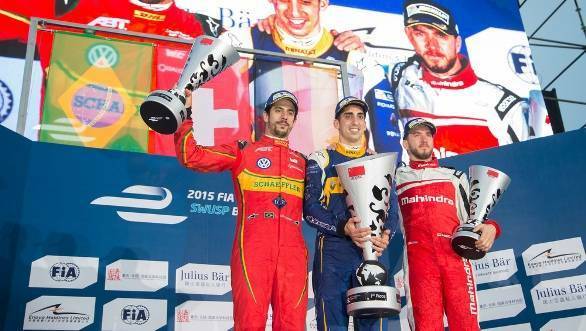 It was a clean sweep for Sebastien Buemi at the first race of the second season of Formula E. The Swiss driver set the fastest lap of the weekend, was on pole, and then managed to take the chequered flag by 11 seconds. Buemi's Renault e.Dams team-mate Nicolas Prost had been leading the rest of the field until Turn 1 when he was overtaken by Lucas di Grassi who maintained second place right till the finish line. Prost had to later retire from the race due to a rear wing failure in the closing stages, opening the course for Nick Heidfeld. Heidfeld finish third, allowing Mahindra Racing to bag their first ever podium in Formula E, a bright beginning to season two, after a dismal first season. It wasn't all smiles for the Indian team, though, with Heidfeld's team-mate Bruno Senna failing to recover from a difficult pitstop and finishing no higher than 13th place. Andretti driver Simona de Silvestro suffered a crash on lap three. Drivers further down the grid took advantage of the resulting full course yellow (FCY) which limited speeds to 50kmph and required drivers to maintain the gap to the car in front at the same distance it was before the caution, prohibiting overtaking. Team Dragon Venturi's strategy of conserving energy on the first stint turned out to be a good move for team-mates Loic Duval and Jerome d'Ambrosio as they took fourth and fifth respectively. Defending champion Nelson Piquet Jr had to start from the back of the grid due to a bad qualifying. His NEXTEV Team China Racing car stopped midway through the race, causing him to settle for 15th. His team-mate Oliver Turvey, however, managed to slide into the top ten when the race saw another full course yellow on lap 15 owing to Antonio Felix da Costa (Team Aguri McLaren) running into the rear of Jacques Villeneuve (Venturi). This also proved favourable for the other Aguri McLaren driver Nathanäel Berthon as he was able to take eighth after Turvey and Sam Bird (DS Virgin). 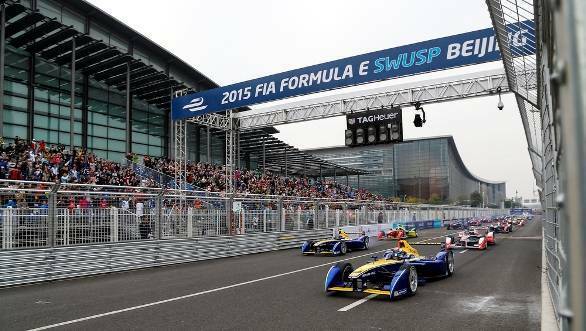 Round 2 of the second season of the FIA Formula E will be held at Putrajaya, Malaysia on November 7, 2015.